So, as seen in the blurb this is m/m. Not seen is that this is my first one, it won't be my last but most likely only in the context of this series. I want to firstly say that there's no KB book I won't read at least once. I knew the second that KB announced Moffy was bi I was probably going to have to take my first shot at this genre, this became more and more clear as they had quite disgusting anons on Tumblr saying that Moffy being bi was a cop out to still have him be with a girl but be LGBT (Yes I know this didn't affect the twins' decision but I'm just discussing how I ended up here). Two things became very clear over the course of this book, 1) It's unlikely I would have picked it up had it not involved the Hales, Meadows and Cobalts 2) If my favourite NA authors couldn't make me love m/m it's never going to happen. I finished the book in one sitting when it released at midnight and have taken this time to really try and process what I really thought of it, to the point that I didn't even give it a star rating when I had finished. It gave me a definitive feel-good vibe at the end but nearly 48 hours later, it hasn't stuck with me in the way that some of their other books have. I really enjoyed getting to know Moffy as an adult in some ways, but in other ways, I felt like he was a bit boring, obviously there's some people that won't read a book at all if the main characters so much as touch anyone else but I'm not that reader and I would have loved to know more about Moffy's "dating" habits and actually have seen them in action. Additionally, choices that he's made as a result of his fame means that he doesn't really do a lot, so apart from when he met family members outside of his house, the plot didn't really move forward that much and I did find myself being drawn to other characters instead of him. Another thing is that I was really and truly disappointed in Moffy and how he dealt with the whole Ryke situation, it's no secret that Ryke is my favourite but even outside of that Moffy was purposefully hurting someone that had done nothing but love him and help keep his parents sober and that really made me irritated at him. For Moffy to be the same age as I am and to make these choices consciously just made him come across as almost cruel - I completely understand the root pain involved in all this, but the lengths he went to almost made it seem like he himself didn't believe the truth and was overcompensating. Lo himself had to tell Moffy that he was going to regret what he was doing but as far as we the readers saw, he didn't really seem to at any point in the book, definitely not in terms to see how he's making his uncle feel. In addition to a grown up Moffy,we get a grown up Jane who is very much her parents' daughter, personality wise. More on her in a sec. I feel like despite the closeness of Jane and Moffy, the circumstances of Moffy and Farrow's relationship meant we didn't see her that much, in theory. Jane and Moffy were weird. In some ways they were the cutest "siblings" of all time, in others it felt Cersei and Jaime like if you know what I mean so I can't say the ending of this book really felt that far left field, however, then I was disappointed in the parents because they should have a better understanding of the people they raised, regardless of any lies/trickery they used on their parents considering they were actual addicts and lying therefore wasn't even second nature, it was just them at that time. I really liked how all the other cousins/sibings were introduced, it took us out of the narrative for a second and were little statements that made me laugh and smile whilst telling me more about the kids I barely got to see grow up. I think (not in a I love Ryke and Daisy Meadows the best way) out of the oldest born children I'm most looking forward to Sulli's story but other characters that I loved were: Luna, Kinney, and Charlie. I'm also looking forward to Jane's POV, I think if readers get to go directly alongside her on her journey to find herself it will be super rewarding. I found myself loving the book the most at the moments that were filled with family, I loved watching the interactions between members both young and old(er please don't kill me original Core 6! ), from different parents and the genuine love that existed between all of the characters that you knew (if you had read the previous books) were there because their mum's had loved each other that much as well. Whist I mentioned briefly earlier how this directly affected Moffy, I think the twins highlighted really well the isolation of growing up with famous parents followed by your own fame as these poor kids have never allowed themselves to have friends outside of their family and not only is it very sad but it also has the negative side effect of restricting what the character can actually do and the situations they can get themselves in. Outside of the family the only people they really interact with are their staff (bodyguards, publicists, on call doctors). I think it's a shame that a whole 20+ years later people can't bring themselves to be nice to the Calloway progeny considering they've literally done nothing to all of these people. Also, I was expecting a Maria pop up but there wasn't one or a career update so good thing there's at least two more books! Secondary characters that I love include Akara, and pretty much all of the bodyguards. I find it interesting how KB have diversified their characters greatly from when they first wrote ATY and literally every named character was a WASP and it was like "I love what you're doing, but why is it so white" so the effort there in addition to the expansion of sexualities is definitely an example of author growth and response to constructive criticism. Farrow. Farrow, Farrow, Farrow. He was...interesting I guess. I liked him enough and I liked learning more about him over the course of the book. He was a good match for Moffy. Whilst I definitely felt the tension between Moffy and Farrow at the beginning of the book, I do wish the second book moved onto someone else and told their story concurrently rather than another book with a romance that's interesting and sweet enough but it doesn't really do anything for me, like I think their cute moments are cute in the moment but once it's over it's left my brain, my biggest worry is that if this only turns out to be a trilogy, I would have spent at least 2/3rds of it in the POV of characters that I can read but (currently, the next book could change that) have no investment in, additionally, assuming the story keeps moving forward, we could miss pivotal moments in characters' lives outside of their POV which I could have found interesting. Despite this, I don't fault KB for their decision to not make this a three-way POV between the cousins only, it sounds like the planning and upkeep for that would have given even the most compartmentalised mind a migraine. 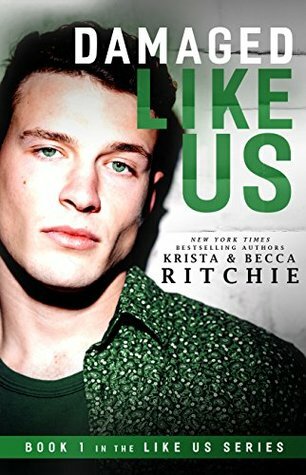 Now I've loved every KB Ritchie book (to the point that my Some Kind of Perfect review is still in my drafts because i thought it was too long but along came this book, so I guess it's time for it to be free) and I would hate for them to think that this is criticism/dislike after criticism/dislike but I just wanted to try and explain my entire thought process as to why this won't be topping my KB Ritchie list. If I'm honest, I couldn't say definitively if the m/m aspect of this book was why I couldn't get into it, as I extreme skim read the more sexual portions of the book so in theory it couldn't really have affected it that much.